The Manitoba government is leading an initiative to reduce red tape and improve regulatory accountability as part of its plan to fix the finances, repair the services and rebuild the provincial economy. Improving regulatory accountability and reducing red tape lowers the cost of understanding and complying with regulations on stakeholders, such as municipalities, not-for-profits and businesses. 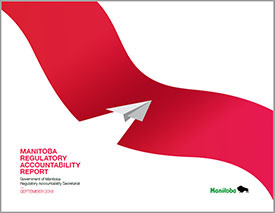 Manitoba is already making progress in its goal of being the most improved province for regulatory accountability by 2020. In June 2017, Manitoba passed The Regulatory Accountability Act, which created the most comprehensive framework in North America for managing regulatory requirements. The act requires government to keep track of how many regulatory requirements exist and where they are located. Manitoba has also introduced measures to define, implement and track progress on reducing red tape and regulatory requirements. Between April 1, 2016 and March 31, 2018, the number of regulatory requirements in Manitoba was reduced by 2.6 per cent; from 948,599 to 924,180. Manitoba Families and Manitoba Municipal Relations showed the largest decreases, with reductions of 15 per cent and 29 per cent respectively. Provincial departments and agencies are continuing their efforts to eliminate redundant and unnecessary regulatory requirements, and make services more accessible.